« Renewable become a profit centre…..
VMware ESXi 4.0 and VMware View. Well I have been installing and configuring a VMware 4.0 service with VM View. This is based upon the ESXi server hosting virtual PC’s either Microsoft or other OS versions. Why? Well one of my business colleague was having trouble with his technical sale man, that had to travel over the world selling and demonstrating a high value addition to AutoDesk AutoCAD 2010 Mapping. It basically allows organisations such as CAA and other such government authorities over the world to analyse the flight paths approach and procedures into each Airport over the world, with all the various types of Aircraft including the 747’s to the smaller type. I believe it even works on fighter aircraft! Anyway, the problem was that like every other Corp Sales person. They, know all about PC/Laptop’s. Which, as every IT person will know. “A little knowledge, is more dangerous than having none!” Users, tend to break things, as its away of not having to do work! Also, having a sales pitch not happen, due to the Laptop not working, is no joke. When, you have just take anything from a 8-24 hours flight to get there. Only for the laptop not to work! Leaving aside, the expense of a hotel, customer embarrassment, Co2 and it’s a waste of productive sales time. One other benefit is it also offers the ability for the software house to rent out the software on a hourly basis. As the virtual desktop can have access to a local USB device. It allows prospective clients to test out the system, without having to send and get returned USB dongles. Thus, another time saving. Might, not have to get on the flight in the first place. Major expense on air and hotel stopped! So, I suggested using the VMware ESXi with VMware View Clients that have the CAD software installed. My collegue looked at me and said that things didn’t go well using RDP. But, I explained that this used the VMware TCOIP protocols. This is based on UDP once connected. Thus, allows adaptive link in providing the screen interface to the client. Which, greatly reduces the bandwidth requirement. I said, “Why, not set up a trial project box, to try this VMWare solution out? As, all of the software we need can be used for 60 days. If, we are impressed, then, we can commercialise it”. As this came with a recommendation from the www.techead.co.uk as a good server. I was thinking about upgrading my trusty Dell workstation anyway. The saying “Garage mechanics have the worst cars!” came to mind. So, I thought, I’ll, purchase this kit and it can be converted into my own Windows 7 workstation afterwards. So, I added two lots of TEAM 4GB PC6400 memory to give a total of 8Gb to the server, for an extra £120. Pressed the order button at 01/02/2010 22:34:13 and the guys at www.serversplus.com delivered via DPD(UK). DPD(UK) site reported delivery between the hours of 12-14:00 on the 3rd. The man gave me the box at 12:58. Don’t you just love it, when, technology actually works! Couple of years ago, I would have had to stay in the whole day! Unpacked the box in the afternoon and assembled the internals. Taking out the 1GB stick supplied and replacing it with the 2 set pairs of 2Gb DDR2 RAM giving the system a total 8Gb. Nice. So, anyone going to make me an offer for this 1Gb? One of the nice features of this HP system, as shown in the video. Was it has an internal USB port on the motherboard. So, I created and ESXi 4 boot image on a Cadology USB 4Gb stick (Knew, it would come in handy. Well done Dawson). By loading the ESXi4 CD and choosing the USB, as the place to install the image. Changed the BIOS to boot off the USB device. This, as the Techead crew had mentioned, saves wasting any of the original 160GB hard disk drive. Well, I knew that the time would come soon, to upgrade the storage system. So, I ordered a WESTERN DIGITAL CAVIAR BLUE 500GB 16MB CACHE HARD DRIVE SATAII 300MB/S <8.9MS 7200RPM – OEM drive from NOVTECH at grand total of £34.88 ex vat and using their low cost, don’t mind service at £1.99. It, turns up on the Saturday morning. Although, you could have survived with 160Gb. I was going to load Windows trials of 2003/8 servers, that tend to need 3-4Gb just to make them take off and I still had to store the ISO images on the server as well. You can use a local DVD/CD drive to install OS on to VMware, but realistically using commercial knowledge, it tends to be a false economy. As, the additional time it takes, costs more in the long run. You can then mount multiple images at one time. ie you can be building several servers/workstations from the same iso image(s). So, if you were creating a Windows 7 Pro and Windows Ultimate virtual workstations you could use the image in parallel, thus, saving time! I was building 3 x 2003 standard servers first. Installed my own local DC on the first and then create the VM Vcenter and VMView on the others. Installing the Vcenter was ok. 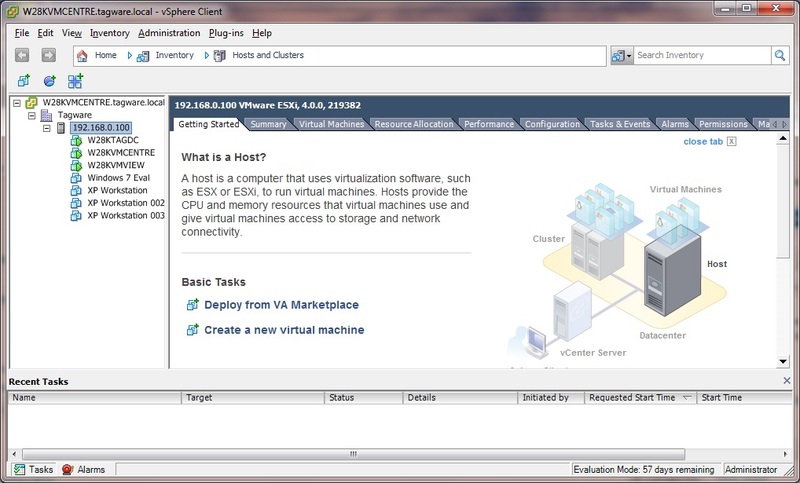 I used the client pointing at the ESXi 4 server host itself until the VCentre was up and running. Re-pointed the VMware client to login to he Vcenter server, and everything came to life. Although, I set the original to 1Gb of RAM it makes the system go a tad slow. (Give it 1.5-2Gb) Then, of course carried on to the VMware View server. All went to plan, until, I tried to install the serial key for the 60 eval licence. “Expired” What? Anyway, I then, looked up at the clock – 1am and decided to sleep on it. Finally, I had 3 W23K servers sorted. Changed the location to UK, as that was where I was. Changed the time to the current time from the 3rd August 2010. Penny dropped! There, was nothing wrong with the other installs. It was the image that was resetting itself to August 2010. Another, reason for the View licence not to register. Of course being a good engineer I had re-booted after the VMware services had been installed to find that servers reset themselves, back to 3rd August 2010!! Yep you guest it. The servers wouldn’t login as the time and date had changed so much from the DC which at the time hadn’t been rebooted. Again, as a engineer. You don’t reboot a single DC without a secondary, unless you really need to. As there is always the chance, that it will not come back. Anyway, I had been here before on the DC time issue. I got the badge in Windows 2000 days! So, I knew how to get around this. Boot in Safe mode then change the date and time to be in line with the DC. Good engineer! Well, yes, that’s how you do it in the real commercial world. However, booting up the server again and we find that the date is back to where it started 3rd Aug 2010! With the message that you have to register or I’ll log you out! OK, give up on the 2003. What about the Windows 2008 Server? Downloaded the trial of this 2008 standard. A download of a 1.8Gb. Of course, the foot print increases and wouldn’t go anywhere without 2Gb RAM as starters. Anyway, will not bore you with the stage by stage blows on this one. Enough, to say. Anyone, reboots those servers, virtual or otherwise, will be not breathing very long afterwards! I now have the systems working and VM View licensed. So, it will now function for 60 days. I built a couple of XP workstations with 2 x 512Mb RAM and the CAD one with a 1Gb RAM. I configured the CAD one with the AutoCAD 2010 for which should tick over for the next 30 days and the others with MS Office 2000, just to prove that this structure works. All on my £400 box! Surprisingly, the VMware statistics tell me that this is ticking over nicely. As, CCS were a AutoDesk dealership. I sold AutoCAD systems. So, I gave the system a work out and it responds really well using the PCOIP protocol. The network traffic was under 0.5%, most of the time. Even, when I started playing the video streams the usage didn’t pop above the 1-2% on the nic. Very impressive!! I can think of quite a lot of commercial reasons to deploy this. Provides image even when difficult conditions on bandwidth. Nothing for the user to upset. If, all else fails, download the VM client to the clients PC (11Mb) near enough to any PC. Able to obtain USB data from the local workstation, if the administrator allows it. Very impressed, on a £400 box. Think of the Green credentials – one 0.250kW server with 16/24 XP workstations, if not more! against 6kW, if left in the real world. Not forgetting the RAM saving as each Windows 7 Workstation would require 2Gb. This could be down to 1Gb in the virtual world as the spare memory would be shared by all of the workstations. You could even get a Carbon Interest free loan from the Carbon Trust to complete the task! At a licence cost of $150 (£80) per virtual client connection, supplied in 10 or 100 users versions, which are co-current, both a large and small organisation, could happily share the licensing connections with other parts of the business or time zones! Should, the snow return in the UK, stopping people getting into the office. Then, you have your solution already established. As, this desktop could be accessed from the employees home via the broadband. Login, with the same Window account login over a SSL linked stream. VMware View allows both Corp base build machines or dedicated builds to individual. For the IT technical crew you update the Corp base image with patches or amendments and all virtual PC’s are dynamically built from this image. Get it wrong! Roll back the image to the one before and everything go back to normal. Try, doing that with SMS 2003 on a 18,000 PC’s site! Yes, SMS can roll- back. But, it isn’t pretty….been there. You can allow the Directors to have their very own virtual PC, that with the right ESXi4 equipment and some VMware software, is near 99.8% available, as your server infrastructure is already of course? With, the addition of some IP telephony, an organisation can be switched to real cloud computing. Allowing, employees to sit anywhere in the world and still have secure access to their virtual desktop. Not that hard, these days with the new satellites providing broadband speeds wherever in the world you are, even in the arctic, if you want to really see snow! I prefer sitting in the warm and not worry about snow. Which, of course, brings me back to the reason in doing this in the first place. Allowing, a sales person to connect to a software secure desktop to demonstrate a CAD system from wherever he is in the world! I think, it will work well enough for the project to progress! You’ll just have to wait until the next post to find out! But, from what I have seen to date. It’s only the latency, between the two sites, I can see upsetting this solution. If, you want to have a go on a real example within the next 60 days, then drop me an e-mail, to sales@tagware.co.uk or post a comment. 1 comment to VMware ESXi 4.0 and VMware View.